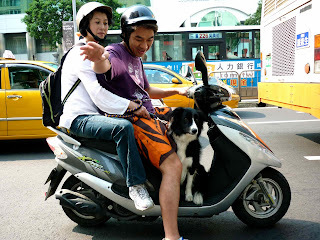 Green Laker: Taiwanese Scooter Dogs! 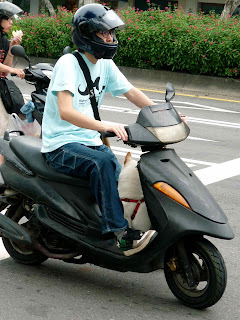 It's a well-known fact, dogs like to go for a ride. 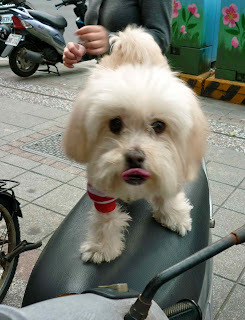 Tongue hanging out, ears flapping in the wind, tails-a-waggin', a ride is to dogs as nip is to cats. 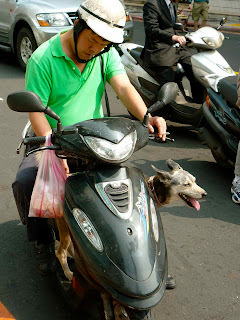 But if your primary mode of transportation is of the two-wheeled variety, it would seemingly present some challenges. 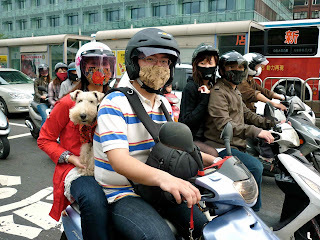 However the Taiwanese are very crafty and are always good adapters. 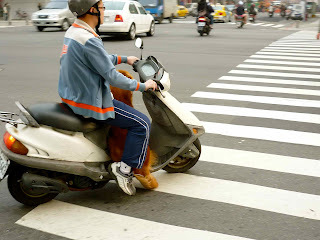 Here's proof, snapped as I walked around Taipei over the weekend. 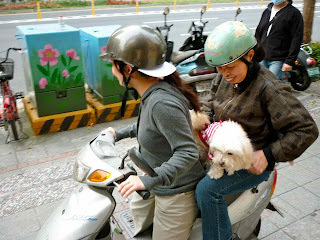 variation of the "family sandwich"
I witnessed this little pooch hop from the scooter's floorboard up to the saddle, anxious to go. 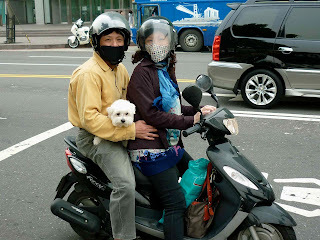 Just because your two-wheeled vehicle of choice isn't propelled by an 80cc two-stroke, doesn't mean that Fido has to stay at home. 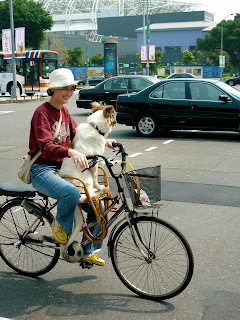 Who doesn't like a Saturday afternoon bike ride? Thanks for taking us along to Taiwan. It was good fun. I cant wait until "we" go back again. Thanks Gary. I was very happy to wake up in my own bed to chirping birds this morning. Regardless of a breeds main ancestral training, most of the behaviour a dog will exhibit will be learned by the training or lack of training from the owner, and its socialisation.